After Mike Glennon threw his second interception of the day against the Buccaneers, which was a pick-6, fans of the deprived winning organization in Chicago went to social media to demand that rookie quarterback Mitch Trubisky take over the starting job. 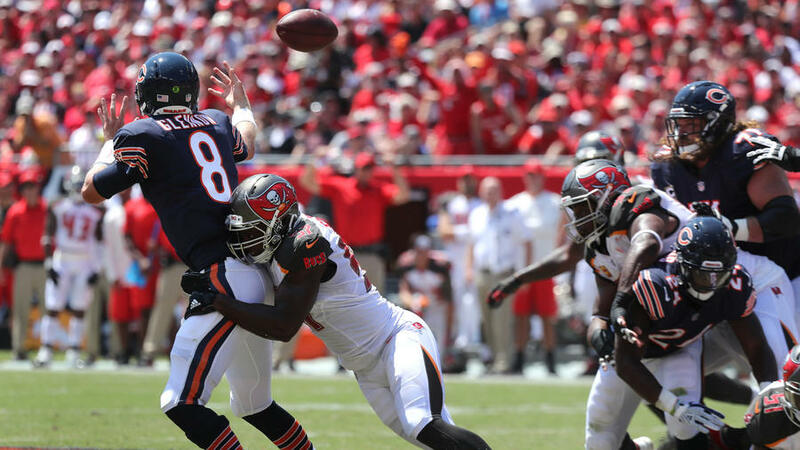 In the 29-7 loss to the Buccaneers, Glennon was responsible for three of the four turnovers (one fumble and two interceptions). With how Glennon performed, there should be speculation in Halas Hall as to when Trubisky will make his NFL regular season debut. But even when Trubisky starts, he won’t make a difference this season. Yes, Glennon has shown some bad tendencies in two starts. He lacks maneuverability in the pocket when pressure is applied, locks on and predetermines throws and is incapable of elevating the play of his teammates. But it’s unreasonable to believe that one player, even a quarterback, can change the entire outcome of this season. Trubisky might provide better quarterback play than Glennon, but there’s no guarantee it will elevate the play of the entire team. And quarterback is only one of the many issues the Bears have on this team. Starting with the offensive line, it isn’t what it was a season ago. Through two games the line has given up consistent pressure and hasn’t created many running lanes for the Bears’ running backs. This could be due to the injuries the Bears are dealing with: Kyle Long is still nursing his ankle, Tom Compton left Sunday’s game with a hip injury and Josh Sitton was unable to finish the game due to a ribs injury. Whoever is playing quarterback for the Bears will have trouble completing passes if there isn’t much time to throw and if the running game can’t work effectively. Not having many downfield threats in the passing game also will contribute to the struggles moving forward. Going into Sunday’s game, the Bears’ top wide receivers were Kendall Wright, Josh Bellamy and Deonte Thompson. That’s not a receiving core that strikes fear into opposing defensive units. The lack of talent at wide receiver allows defenses to play up, which is why the running game hasn’t made much of an impact this season. And with the current receivers, Bears’ offensive coordinator Dowell Loggains has made it evident he is more comfortable with his passing unit going horizontal rather than vertical. Glennon also didn’t get much help from his receivers, who were dropping catchable balls all game. Defensively, the Bears have their own set of issues. Other than Akiem Hicks and at times Eddie Goldman, who got his first sack of the season against the Bucs, the defensive line isn’t generating much pressure. Players like Mitch Unrein, Jonathan Bullard and Roy Robertson-Harris must have more of an impact moving forward. The Bears’ outside linebackers, which was supposed to be one of the strengths of the team, have underperformed. Out of 61 passing attempts between both the Falcons and Buccaneers, Willie Young is the only outside linebacker to register a sack. With a Pro Bowl caliber player like Leonard Floyd lined up on the opposite end of Young, he should be making more of an impact in the second year of his career. For the backend of the defense, the secondary hasn’t done the best job of staying with opposing receivers. There were multiple times where Buc’s receiver DeSean Jackson beat members of the secondary deep and luckily the unit was bailed out with inaccurate throws by Jameis Winston. The Bears will face Ben Roethlisberger next week and Aaron Rodgers the following week, those two quarterbacks will make sure they hit their open targets. To add to the list of issues with this Bears’ team, the most glaring one and the one that has been prevalent since John Fox took over as head coach is injuries. In 2015, the Bears had 18 players placed on IR, 19 in 2016 and the names are already pilling up this season. For the most part, the Bears’ overall talent has improved from Fox’s first year but if injuries continue to dismantle the team, they can’t be competitive. A team can only have so many injuries before it’s too much to overcome. The Bears are slowly getting to that point. Already the Bears are without their top two receivers in Cameron Meredith and Kevin White and their leader on defense Jerrell Freeman. With everything the Bears are dealing with, it won’t matter if Trubisky takes over at quarterback. Yes, he might provide a new sense of hope for the team but let’s not think the 23-year-old can solve all the Bears’ problems. Trubisky will start at some point this season if for one reason and one reason only… to get the rookie mistakes out of the way. Hopefully to insure 2018/2019 season will be better. Bears rUN down Pittsburg. Glennon has 4 more turn overseas vs. Packers. He is a bumb. Bears want to train rookie on bench. Glennon learned on bench for most of 3 years, that didn’t work very well. Play the kid.